Theater and music have become for artist Marc Chagall sources of great inspiration for the realization of the best creative works. Chagall had a Jewish background, and therefore, traditionally from childhood, the future painter was instilled a love of music and art in general. He grew and absorbed this atmosphere of admiration for musical creations. In the future, leaving his home, he retained in his heart affection for the musical sphere. This ultimately greatly influenced the character of his paintings. Cloth “Music” was written in 1920. A large figure in the center of the composition is a violinist. 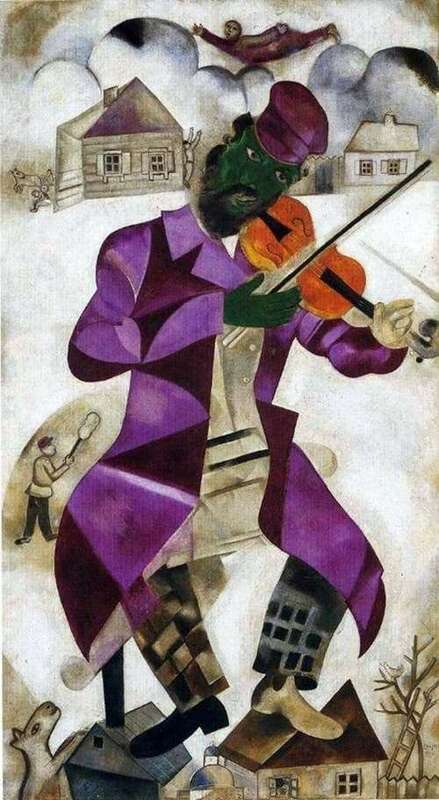 Chagall often chose the image of a violinist to represent a musician. This is due to the origin of the artist. The violinist always accompanied the Jewish family at any significant events: on holidays, weddings and funerals. The painter Chagall writes not ordinary violinist. The whole picture in the extreme seems to the viewer bright and avant-garde. First of all, the figure of the musician is depicted extremely large. With his feet rests the violinist on the roofs of small houses. The background is almost lost with such a contrast. On a man there is a bright purple raincoat, the violin is highlighted by a flaming orange color, and most unusual is the hero’s face has a rich green tint. If you look at the background of the picture, there will be even more questions. Elements of urban buildings are shown unfinished. There are several small figures of people and animals who are clearly passionate about the violinist dancing on the roof. A person floating in the sky completely unsettles the mind, who has become accustomed to realism. Marc Chagall superbly portrayed the triumph of music. His colorful playing violinist looks dynamic. He conveys to the audience in some unknown way powerful energy. It is a symbol of the rebirth of man through the attainment of art.